Three uphill races today: This really calls for some reward that should better be a good one. 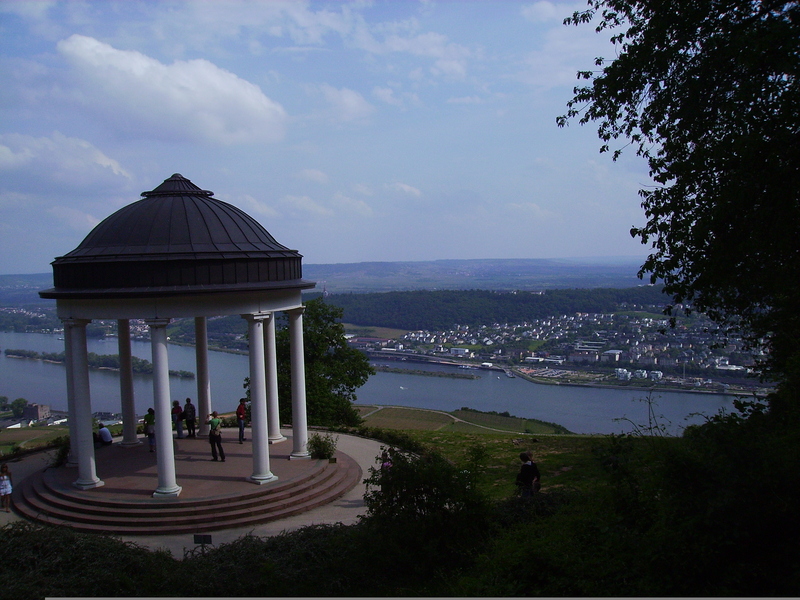 And, as it turned out, it was a great reward to have the last carb loading stop of the day right next to Niederwald Monument hovering above the Rhine, overlooking it towards Bingen. 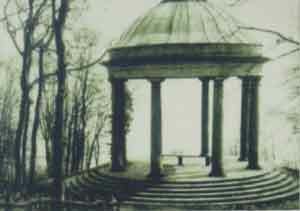 Niederwald Monument was built in 1788 by Count Karl Maximilian von Ostein, looking like a classic temple albeit is was meant as nothing more than a piece of art decorating the parks the count had opened for the public to take their leisure walks in during the weekends. This has been a rather radical social move in the late 18th century still and was, consequently, very well accepted by the local people. 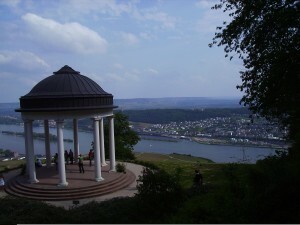 In 1849, the monument had made it into the most important and influential travel guide of the time, into Baedekers Reiseführer that called the temple „unquestionably the most beautiful spot in all of Niederwald“. The picture above shows what the temple looked like until it was completely destroyed on November 25, 1944 by WWII bombings of the city of Rüdesheim. And gone was the sight that had already inspired big poets such as Johann Wolfgang von Goethe and Clemens Brentano alike. 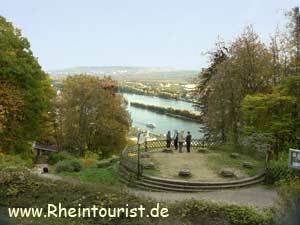 However, in the first years of the 21st century, politicians realized that Niederwald momument was not only still popular with locals and tourists alike, but may play an important role as Rheingau gate to the UNESCO World Cultural Heritage of Upper Middle Rhine (Oberes Mittelrheintal). And, even better, its reconstruction was actually a financially pretty minor task, an investment in the lower six-digit Euro range. So, for once, bureaucracy did not hinder culture for any longer (then again, nobody had done anything in order to get rid of the shame of almost 60 years of destroyed culture and art being left to itself); and since 2006, the temple is the crown of Ostein park again, restored to its former beauty and pride as was admired by Goethe.